The flooding of a stream or river is a natural and recurring event. Ancient cultures that lived along these waterways welcomed the flooding of the adjacent land. The material deposited enriched the soil, increasing its fertility for farming. For those along the Nile River in ancient Egypt, the annual flood was the "gift of the Nile." In many modern societies, however, the lands bordering rivers and streams are sites of homes, businesses, and other urban development. The flooding of this land is often a costly natural disaster. A floodplain (sometimes spelled flood plain) is an area of nearly flat land bordering a stream or river that is naturally subject to periodic flooding. A flood occurs when the flow of water in a stream becomes too high to be accommodated in the normal stream channel. The channel of a stream is the trench or depression filled with water as it flows across a landscape. The sides of the channel are known as the stream's banks. The bottom is the stream bed. immediately slows down. The material carried by the stream—sediment such as gravel, sand, silt, and clay—is deposited on the floodplain. Large particles are deposited first, and much of this material is laid down alongside both banks. This process, repeated over and over, forms low ridges or mounds known as natural levees (pronounced LEH-veez). Levees built by humans along rivers in an effort to control flooding are known as artificial levees. Natural levees are composed primarily of gravel and sand. They are steep on the side facing the stream channel and gently sloping on the other side. Varying greatly in size, levees may be several feet in height and up to a mile or more in width. The finer sediments transported by the floodwater, silt and clay, are deposited on the floor of the floodplain away from the levees. The general term for sediment deposited by running water is alluvium (pronounced ah-LOO-vee-em). Because floodplains are covered with alluvium, they are often called alluvial plains. Lower, poorly drained areas on the floodplain that not only collect alluvium but also retain water are known as backswamps. Floodplains are widened as a stream snakes its way across a landscape. Streams and rivers rarely flow in straight lines. They have a natural tendency to flow along a path of least resistance, eroding any soft material along their banks. Because of this, many stream channels form a series of smooth bends or curves called meanders (pronounced me-AN-ders). The term comes from the Menderes River in southwest Turkey, which is noted for its snakelike or winding course. As a stream begins to meander, erosion will take place on the outer parts of the bends or curves where the velocity or speed of water is highest. These eroded areas are called cut banks. Sediment will be deposited along the inner bends where the velocity is lowest. These deposits are known as point bars. As erosion and deposition continues, a stream tends to change shape and shift position across its floodplain, which enlarges in response to the stream's back-and-forth movement. Eventually, a meander forms a tighter and tighter curve until it almost becomes a complete loop. The stream then shortens its course by eroding through the intervening land or neck of the loop, especially during times of flooding. Sediment is deposited, isolating the meander from the stream. Still filled with water, the crescent-shaped meander is called an oxbow lake (because it resembles the U-shaped collar used with teams of oxen). In Australia, an oxbow lake is known as billabong (pronounced bill-ah-BONG); in Louisiana and Mississippi, it is sometimes called a bayou (pronounced BY-oo). Over time, as the floodplain is repeatedly submerged under water, alluvium fills an oxbow lake, turning it into a marsh and eventually into a meander scar. The dry meander scar, which typically only holds water during rains, still retains the shape of the original meander. A small stream that enters a floodplain and flows alongside a larger stream or river for quite a distance is known as a yazoo stream or yazoo tributary. It helps drain the floodplain, but is often prevented from joining the main stream by the stream's natural levee. Only when it finds a low or weak place in the levee does it flow naturally into the larger stream. The term describing this type of small stream comes from the Yazoo River, which flows parallel to the Mississippi River for 175 miles (282 kilometers) before it joins with the larger river. Running water is the primary force of erosion on the planet. Streams and major rivers are continuously at work moving rock fragments and dissolved materials from elevated landmasses to oceans, lakes, and other streams and rivers. Worldwide, streams transport 16 billion tons (14.5 billion metric tons) of sediment per year. They alter landscapes through both erosion and deposition. A general term for sediment (rock debris such as gravel, sand, silt, and clay) deposited by running water. The lower, poorly drained area of a floodplain that retains water. A low ridge or mound along a stream bank, formed by deposits left when floodwater slows down on leaving the channel. A bend or loop in a stream's course. A crescent-shaped body of water formed from a single loop that was cut off from a meandering stream. Fine earthy particles that are smaller than sand and carried by moving water and deposited as a sediment. The exposed portion of a former floodplain that stands like a flat bench above the outer edges of the new floodplain. A small stream that enters a floodplain and flows alongside a larger stream or river for quite a distance before eventually flowing into the larger waterway. Geologists characterize streams as youthful, mature, and old. When a stream is in its youthful stage, it has a fairly straight channel and a steep gradient (the slope it runs down). It generally flows in a V-shaped valley in a highland or mountainous area. Its velocity is high, and it is actively lowering its channel through erosion in order to reach base level. This refers to the point at which the stream or river reaches the elevation of the large body of water, such a lake or ocean, into which it drains. While aided by gravity, a stream will downcut or erode its channel deeper and deeper in order to reach the level of its final destination as quickly as possible. If the difference in height between the stream or river and its destination is great, so will be the erosive or cutting force of the stream. In this stage, a stream has little, if any, floodplain. By the time a stream reaches its mature stage, its gradient and velocity are moderate. The valley it flows through is more U-shaped with rounded hills. Because it has slowed down, the stream begins to meander. While it is still eroding downward, the stream's main force of erosion is lateral (horizontal) as it begins winding back and forth, carving out a valley floor between valley walls or bluffs. Periodically, the stream will flood all or a part of its valley, depositing alluvium on its developing floodplain. An old age stream has reached its base level, and its gradient and velocity are very low. It has lost its ability to erode downward. In fact, it deposits as much material as it erodes. The stream meanders greatly in its nearly flat valley. It has an extensive, well-developed floodplain marked with oxbow lakes. Streams and rivers are conduits for transporting sediment. The ability of a stream to move sediment depends on the velocity of water in the stream and the size of the sediment particles. Water moving at a low velocity can move only small, fine particles such as sand, silt, and clay. Sand is a mineral particle with a diameter between 0.002 and 0.08 inch (0.005 and 0.2 centimeter); silt is a mineral particle with a diameter between 0.00008 and 0.002 inch (0.0002 and 0.005 centimeter); clay is a mineral particle with a diameter less than 0.00008 inch (0.0002 centimeter). Water moving at a high velocity can move both small particles and large, coarse particles such as boulders. A stream will continue to carry its load of sediment as long as its velocity remains constant or increases (if it increases, it can carry an even larger load). Any change in the geography of the landscape that causes a stream channel to bend or rise will slow the flow of water in a stream. As soon as a stream's speed decreases, it loses the ability to carry all of its load and a portion will be deposited, depending on how much the stream slows down. Particles will be deposited by size with the largest settling out first. Floods occur when excessive rainfall or melting snow produces more water than the soil can absorb and a stream can normally carry in its channel. Several things happen to a stream when it floods. The increase in the amount of water causes the stream to flow much more rapidly than usual. This, in turn, greatly increases the amount and size of the sediment the stream can transport. Large boulders in stream beds are moved during floods. When a stream overflows its banks, its floodplain increases the area of the stream's channel. Flowing in this now much-wider channel, the water immediately loses velocity, and its load of sediment is deposited. As is always the case, larger particles drop out first, forming levees alongside the stream. The finer-grained silts and clays are carried farther out onto the floodplain where they settle after the waters of the flood recede. Large floods are often given designations that describe the statistical probability or chance when they might occur. A flood can be termed a 10-, 20-, 50-, 100-, or 500-year flood based on its expected recurrence. The larger the flood, the larger the "year." A 100-year flood, for example, is determined to be the maximum amount of flood to be expected in a 100-year period. A 20-year flood is the maximum amount of flood to be expected in a 20-year period. This does not mean, however, that a 100-year flood will strike only once every one hundred years. It means that there is a one in one hundred, or 1 percent, chance of a flood of such magnitude occurring in any given year. Depending on rain and other weather conditions, a 100-year flood may be followed by another similar flood only a month, a year, or twenty years later. In March 1973, as a result of rain and snow melt, a 100-year flood occurred on the Mississippi River. Just twenty years later, the Mississippi River was subjected to an even larger flood. One of the largest floods in U.S. history, it affected some 16,000 square miles (41,000 square kilometers) and caused property damage in excess of $15 billion. 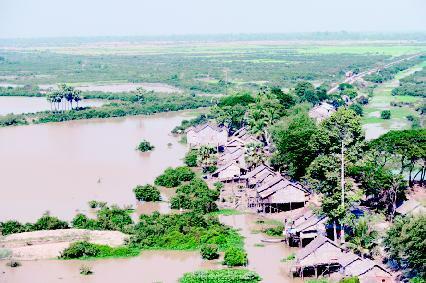 Forty-eight people died in the severe flooding. A floodplain becomes flooded on average once every year or two, most often during the season with the highest amount of rainfall. As the flooding process occurs over and over, meander curves enlarge, alluvium is constantly reworked, and the floodplain widens. The continual wetting and drying causes the sediment to be compacted in the levees. The highest points on a floodplain, natural levees may grow large enough to control the amount of flooding that occurs. Silt and clay deposited on a floodplain make the soil there extremely fertile. As a result, a floodplain is rich agricultural land. The disadvantage of farming on a floodplain is the natural hazard of floods. Ancient civilizations were aware of the recurring nature of floods on streams and rivers, and they planned their plantings accordingly. In the present day, rivers are important sources of water, power, and transportation. Fertile floodplains are sites of increasing urban development. To control small annual floods that threaten homes and businesses, many communities have erected artificial levees. These walls built along a river to prevent high water from leaving the channel seem to work well for small floods. However, the levees upset the natural function of a floodplain, which acts as a reservoir for the excess water. Instead, the flood moves downstream until it finds a place not protected by artificial levees. And no artificial levee can be constructed high enough to contain very large, unpredictable floods. The building of dams is another method used to control flooding, and these structures work to a degree. They store water in artificial reservoirs that can be used during dry seasons or at other times when water levels are low. The release of that stored water in a controlled manner can also help generate electricity. Like artificial levees, however, dams may be overwhelmed by large floods, leading to disaster for those living downstream of the dam. Dams also trap sediment, so land downstream is deprived of material that would make it fertile. The natural conditions on a floodplain are destroyed, and farmers must turn to chemical fertilizers and other artificial means to help crops grow. This increases both economic and environmental cost. Over the course of perhaps a few hundred years, the sediment trapped by a dam will eventually fill its reservoir, and the dam will become useless. 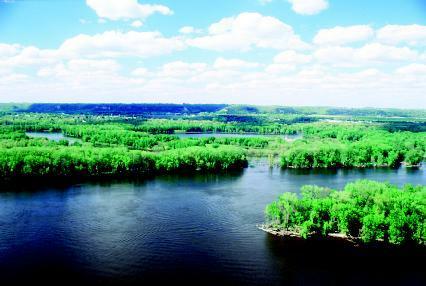 The Mississippi River is one of the world's great rivers in terms of both the amount of water it carries and its length. It flows south across the United States, somewhere east of the country's center, and empties into the Gulf of Mexico in a great delta. It runs for about 2,350 miles (3,780 kilometers). It has many tributaries, the most important of which are the Arkansas, Ohio, and Missouri Rivers. The Mississippi River is divided into two main sections: the upper Mississippi runs from its source in Minnesota to the city of Thebes in southern Illinois where it meets the Ohio River, and the lower Mississippi runs from this point south to the Gulf of Mexico. 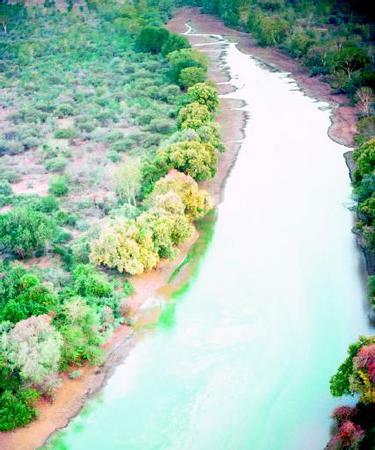 The river's floodplain encompasses more than 30 million acres (12 million hectares). Most of this floodplain, approximately 25 million acres (10 million hectares), occurs adjacent to the lower Mississippi, which meanders in great loops. Natural levees, oxbow lakes, and marshes mark this area. The Mississippi River is one of the most heavily engineered natural features in the United States. The character of its floodplain has changed to accommodate agriculture and urban development. Ninety percent of the floodplain lies behind levees, many of which have been artificially created. Twenty-eight locks and dams were constructed on the upper Mississippi River to allow the passage of ships. As a result, much of the river's floodplain fails to receive its revitalizing seasonal floods. Extensive water pollution has also affected the river and its floodplain. The Nile River is the longest river in the world. It runs approximately 4,160 miles (6,695 kilometers) from the Luvironza River in Burundi in central Africa to the Mediterranean Sea on the northeast coast of Egypt. It flows toward the Mediterranean, draining about 1,100,000 square miles (2,850,000 square kilometers) of land, which is about one-tenth of the area of the African continent. In ancient times, the Nile River flooded annually, caused by rains in central Africa and melting snow and rains in the Ethiopian highlands. The river was at its lowest point in May, but from June to August it rose rapidly, carrying great quantities of silt in its waters that flowed out over the river's floodplain. The flood was at its highest point in mid-September. By October the waters began to recede, leaving pools of water in backswamps. After the water was absorbed by the soil, the ancient Egyptians planted their crops in the fertile floodplain. water sources. Because the river does not bring new sediment to areas downstream, soil erosion has become an additional problem. 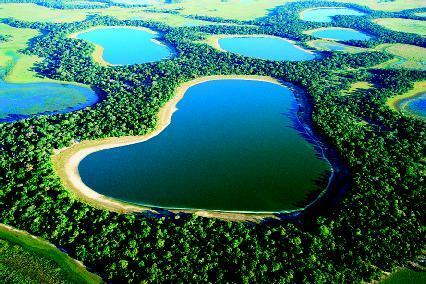 The Pantanal (pronounced pen-te–NAL; Portuguese for "swamp") is a land area covering approximately 77,220 square miles (200,000 square kilometers). Lying mostly in west-central Brazil, the Pantanal also reaches into eastern Bolivia and northeastern Paraguay. During the wet season, from November to April, this vast floodplain of the Paraguay River and its tributaries becomes partially submerged. Average annual rainfall in this area measures between 39 and 55 inches (100 and 140 centimeters). The slope of the land is very slight, and the rivers and streams cannot carry the excess amount of water. The floodplain is swamped by a flood that takes six months to travel the length of the Pantanal from north to south. Areas of the floodplain are alternately flooded, then left dry with only a few spots of water remaining. The Pantanal is considered one of Earth's richest ecosystems (an ecosystem is a system formed by the interaction of a community of plants, animals, and microorganisms with their environment). It is a landscape of swamps, seasonally flooded grasslands and woodlands, and different types of forest. This mixture helps the Pantanal house the highest concentration of wildlife in both North and South America. Approximately 700 species of birds inhabit the area. It is also one of the last refuges for many threatened South American mammals, including jaguars, pumas, manned wolves, giant otters, giant anteaters, giant armadillos, and marsh deer. Bridge, John S. Rivers and Floodplains: Forms, Processes, and Sedimentary Record . Malden, MA: Blackwell, 2002. "Basics of Flooding." Floodplain Management Association . http://www.floodplain.org/flood_basics.htm (accessed on September 1, 2003). "Floodplain Features and Management." Shippensburg University . http://www.ship.edu/~cjwolt/geology/fpl.htm (accessed on September 1, 2003). "Floods and Flood Plains." U.S. Geological Survey . http://water.usgs.gov/pubs/of/ofr93-641/ (accessed on September 1, 2003). Keep up the good work. Nice article, I really enjoyed. In reference to Pantanal, I learned so much abiut the area and I wish to visit there as soon the Carnival in Salvador bahia finishes. dear writer,i see that you have a great pictures of floodplains and lots of info bout it...keep up the good work! oh wow that picture is so amazing and this explains a lot about the floodplain and etc . ! Can you tell HOW floodplains are created? Please show a diagram of it using steps. This can be really helpful. Thanks. Overall, I love all the information about science you give out. This article really helped with my research. Thank you!! You guys have a lot of information about floodplains for the world. Pretty cool. A lot of cool Information. I'm taking biology and it helps me a lot. Awesome sauce.